Update: Here is a link to the Crochet Pattern: Textured Slouchy Beanie – 5 Sizes. If you need more slouchy beanie sizes: baby, toddler, child, woman, and man, then that’s the pattern to try! The slouchy beanie can be worn in many different styles. Slouch it to the front to form a floppy brim, slouch it to the back for a relaxed look, or to the side as a traditional beret. This beanie is able to fit my head, which is small, and my friend’s large head since it’s made to be loose and roomy. Just in case you find that it doesn’t fit the way you like, there are instructions for altering the beanie in the pattern. Gauge Swatch: 3’’w x 2’’h (7.5cm x 5cm) ch 14. Note: by now the bottom of the beret should fit snugly above your ears. If it is too loose, add another round of decrease and if it is too tight, remove round 17. If you would like your beret to be longer, repeat the last round in the pattern as desired. 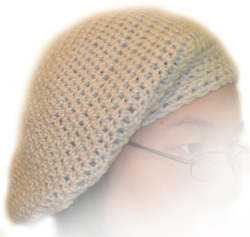 If you need additional help with crocheting the slouchy beret, let me know by leaving a comment! If you would like to support Crochet Spot in creating patterns and tutorials you love, visit the Crochet Spot Store for more patterns! This entry was posted on Tuesday, May 26th, 2009 at 12:30 AM by Rachel Choi	and is filed under Free Crochet Patterns. You can follow any responses to this entry through the RSS 2.0 feed. You can leave a response, or trackback from your own site. Nice pattern! I’ve made 3 of these in the past week….two out of Red Heart Super Saver yarn and one out of Sugar n Cream cotton. All came out really nice! I’m starting another tonight using Caron Simply Soft. Thanks Rachel! Thanks so much for posting this pattern! I’m working on one for my brother (who loves these types of slouchy beanies). Unfortunately, I don’t quite have access to an I hook, but I have an H hook at my disposal. I was wondering how this would affect the sizing on a person’s head, and whether or not I would need to add stitches or rows to make it fit properly? I googled the affects of using smaller hooks and it said it would make the final product smaller, but I was wondering how small it would be and whether or not it’s necessary for me to go and buy a new hook for this project. Thanks! I had to use a G hook in order to get the gauge to come out right. I must crochet very loose. I’d check my gauge if I were you and use whatever hook creates the gauge stated in the pattern. I’m a Crocheting novice and decided to use you pattern to make a hat for winter. I followed it to the stitch and it came out HUGE! What did I do wrong? When I put it on, it looks like a Bob Marley hat, which is not the style I was going for. My friend saw the hat and tried it on. It look rather nice with her long hair, but with my short bob, not so much. I’ll just give it to her as a gift, but I would like one for myself… just a little less Rastafarian. Hi Bre, it is suppose to be a very slouchy hat, so if it fits on your head without falling off you probably did do the pattern correctly. If you’d like a less slouchy hat, you can do less of the increasing rounds so that the hat won’t be so big. Feel free to play around with it it get the hat you desire. I am making this hat, however it did come out pretty large. I am only to the 15, 16 & 17 round and I can’t seem to make it decrease. Explain (2dctog) Is this the same as 2 dc in the next dc? My hat looks like a space ship. My Granddaughter is waiting for it, but there is no way she can keep it on. I am wanting to have my beanie 2 different colors where the bottom is a few rows of the 2nd color and I was wondering at what row I should change to my second color. Samantha, you can change to the second color when you get the the last few rows of the beanie. It all depends on how much of the second color you want. Feel free to experiment with it! HI Rachel, I made this hat and it is really nice. thanks! I was wondering if you can give me the measurement/no of stitches for baby sice 24 to 36 months for the same pattern. Want to make one for my Nephew. I wish I could post pics of this hat. I have made three of these so far. No matter the color or yarn it looks beautiful. I used a J hook for one and it was just a tiny bit larger but I liked the larger stitches for that one. The rest have been with the I and in my opinion they are perfect. I have also done this with the first three rows being three different colors. Love it! Thank you so much for the pattern. It will definitely be a staple pattern for the teens and ladies in my life. Hi! I just made this hat and it turned out awesome! I added a single row of single crochet stitches after row 18 just to have a “finish” and I love it! So easy and fast to make I made two in one night! Thanks for the pattern will be doing a lot of these for friends as well! what actual is a gauge…i want to start working on the hat but i dont know what this gauge is. Hi Ebony, here’s a post that’ll tell you more about gauges: What the Heck is a Gauge? Hi Rachel! So I did the first round and now im working on number 2. It says to “chain 3 and 2 dc in each dc to make 24 stitches total. When I do that I have a huge hole from my 3 chains. Will this work itself out? Sorry for the beginner questions, I no longer am in touch with my crocheting buddies. Hi Danielle, it usually works itself out. If you are really concerned about it you can try to use a chain 2 instead of a chain 3. Hi Rachel, Love the pattern. Does the ch3 count as the first dc of each round. Hi Sharon, the ch 3 does not count as a double crochet. The beginning chain would only count as a stitch it if it was noted in the pattern. Hi, I just wanted to know if there is any way to do this on a loom. I cannot knit, crochet or do any of that without a loom. I love making beanies and scarves with it but that is all I know how to use. If there is a way please add it. I would like to make this beanie. Thank you. Thank you so much, I made this for my granddaughter yesterday and she loves it. I think I may make more, so fast and easy. You are a gem to share. I seem to have a problem with following even simple instructions for a typical hat pattern or anything that is not shown as a video. I have tried countless times to read a pattern and get any where with it. I always get stuck in spot. Is there anyway you can help me with getting me to be able to read a pattern and finish something with reading it. I finished round 14 and have the required 84 stitches. I know how to do the dc2tog, and I did them all the way around, it says we will have 72 stitiches. I dont even have that many at all, confused why I don’t. I have 44?????? help…..
Just got it nevermind…lol I read it wrong. I figured it out. Thanks!!! Love this pattern. i am making this hat using #5 bulky yarn and using a j/6mm hook. i think i may start descreasing at row 17 instead of 15 but so far its looking good!! would that work okay or would it change the size too much? could i change hook size/stich count to fix it if so? Hi Amy, yes the bulky yarn will definitely change the size of the hat. If you can match the gauge in the pattern by using a smaller crochet hook, then you can work the pattern as is. If not, then you can remove some rounds. I haven’t made the hat with bulky yarn yet so I can’t tell you what to remove, etc. Also, the bulky yarn may make the hat stiffer than intended. You are more than welcomed to experiment with it, and let us know how it goes! Love my hat! Posted a picture of myself wearing on my Facebook timeline, and a gal said she wanted one–offered to pay me for it! I told her I’d make her one for free, just asked to say a prayer for my family. I have been looking for an easy hat like this; I am sure it will be perfect for those people who have requested it and also for some charily crocheting for our local Santa Claus Girls, which gives Christmas gifts to needy children. I plan to double the head band, turn it to the inside and slip stitch it in place. Thanks so much. Would this be double knitting wool or chunky wool? Do you have a felting version of this hat? Not sure how large I’d need to make it to then felt it and still have it fit an adult size head. I’d recommend starting by making a small swatch with your yarn, then measure it, felt it, and measure it again. You can compare the ratio of the original size to the felted size then you’ll know how much bigger you’ll need to make your hat. Hi Jordan! I think what you are looking for is a regular beanie that has extra rounds so it’s longer. This pattern has the extra rounds, but it is also wider. The looks are similar but slightly different. Before you get to round 15, the beanie is suppose to be huge so that it gives you the slouchy look later. Round 15 is where it starts the decreases so that when you are done all the decreasing rounds it should fit your head. Could you explain the instructions sl st in 3rd ch of ch-3 at beg of rnd? I understand the slip stitch in the 3rd chain of the chain but not the 3 at beginning of round. Thanks!! The “ch-3” is the chain 3 that you made at the beginning of the round. So you’ll slip stitch into the third chain of the chain 3 that you made. Love this slouchy. I’ve counted & counted & there’s no way I can get the count per row to come out right w/o adding the ch-3 as a st. What am I doing wrong? Hi Judy, try to double check that you aren’t accidentally skipping a stitch, like where the ch 3 is. If you are used to counting the beginning chain as a stitch, you may be used to skipping the first stitch as well. Great pattern just one question to make slouchy longer you say to Repeat last round would that be round 19?? I just had to take time out to tell you that I have made 6 of these hats, everyone loves them. I just finished one that I made for my grandsons second grade teacher for Valentines day in variegated pinks and burgundy with a matching scarf, I can’t wait until he gives it to her on Friday at school. Want to know what she thinks of it. Love your patterns. Hi Janice! That’s wonderful to hear 🙂 I’m so glad that you are enjoying this pattern and folks are enjoying the hats that you are making. Thanks for sharing. Keep up the crocheting! Rachel, does this start with a magic circle? Otherwise, wouldn’t there be a hole at the top? Hello! I didn’t use the magic circle, but you definitely can use it for this project if you prefer. I used the “ch 4, 12 dc in 4th ch from hook” and when I’m done I go back to weave the yarn ends in, I weave the beginning tail in so that there isn’t a hole at the top.